Looking for wireless Bluetooth headsets that deliver crystal-clear audio together with incredible battery life? Simple to use and compatible with a huge range of devices, Jabra’s range of headphones and earbuds make the perfect companions for your lifestyle. With advanced sports earbuds that won’t let you down during a workout, noise-cancelling headsets to help you concentrate in a busy workplace and hands-free kits that make calls a breeze wherever you are, we have the earphone technology for you. And whether you’re looking for a set of personal earphones or a business solution for your office, we make it affordable to achieve outstanding results. 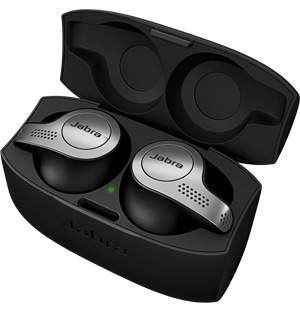 Using Bluetooth technology to pair with your phone or tablet couldn’t be simpler, and with products optimised for your favourite platforms including Skype, Google Hangouts and Cisco WebEx, you’ll find Jabra headsets just as easy to integrate into your workday as your personal life. 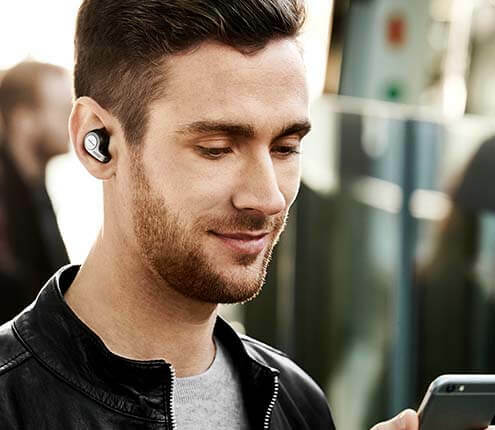 Whether they’re for work, pleasure or a little of both, our wireless Bluetooth earbuds and headsets offer a smart, convenient way to take important calls and listen to your favourite music on the go. Designed to offer the highest audio quality possible, our wireless range also includes products with wind and water resistance, as well as long battery life and easy charging to ensure they’re ready to go whenever you need them. Jabra Evolve 75e is engineered to be the first professional UC-certified wireless earbuds. Featuring Jabra’s new 3-microphone technology, Active Noise Cancellation, an integrated busylight and 14 hours of battery life. Jabra Elite Sport are the most technically advanced true wireless sports earbuds with superior sound for music and calls with up to 13.5 hours charge.